A bull buffalo finds life-giving grasses beneath the snow. Photo by Jaedin Medicine Elk, Buffalo Field Campaign. Things remain quiet on the front lines, in both the Gardiner and Hebgen Basins. 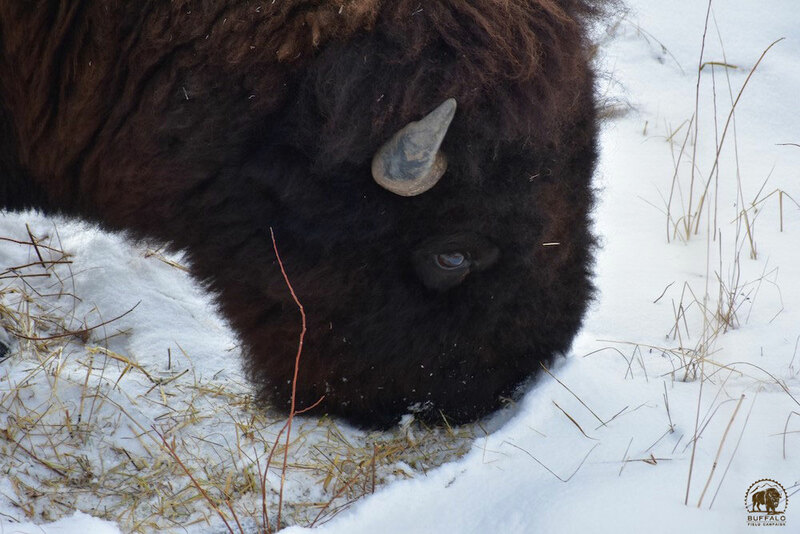 We had a pretty intense snowstorm come through both Basins late last week, which we thought for certain would trigger migration, but, once again, the buffalo showed us that just when we think we know, they have other things to teach us. Gardiner patrols last week were keeping an eye on three mature bulls who were inching their way into the Basin, moving onto the school’s football field, and north to a place we call Powerline Flats. This is the southernmost point where, if Yellowstone’s trap is open, buffalo can be in danger. But, these bulls were pretty comfortable just sticking around the area, and have since moved south again, a little deeper into the Park. As we reported last week, we were also keeping a close eye on a solitary mom & calf pair, who had been staying safe, hunkered down on private land known as the Chapman Easement. Even so, their visibility was enticing a handful of hunt parties, who were just hoping and waiting for this lone pair to move into the hunt zone. These buffalo have since left the Chapman Easement, and patrols reported that it could have been a mountain lion who convinced them to leave. A cat was spotted in that area, along with a couple of deer that this beautiful feline was dining on. Vulnerable, alone without the rest of their family group, the mama buffalo decided that her calf was not safe, so she did what she needed to do and vacated the premises for a few days. Today, patrols reported seeing them back at the Chapman Easement. Bull buffalo graze peacefully, unfazed by the morning’s blizzard conditions. Photo by Stephany Seay, Buffalo Field Campaign. 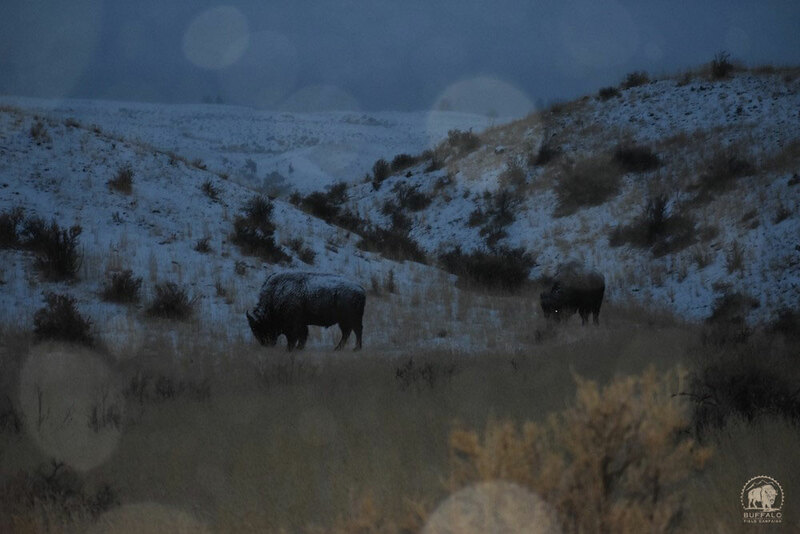 The day before last week's storm hit, we thought things were about to change for the worse: we were scoping the high hills that drop down into the Gardiner Basin, and we counted no less than 200 buffalo in those hills, looking poised for migration. We thought for sure that the strong winds and blizzard conditions would certainly bring them down the mountains towards the danger zone. After all, significant snow accumulation was predicted, and the winds were coming from the north, and buffalo tend to always face into a storm. The following morning, however, expecting to see hundreds of buffalo, except for the two small groups we’d been watching we saw no other buffalo anywhere. Instead of moving into the Basin, they had turned around and headed back into the Park. For now, buffalo are staying safe from Yellowstone’s trap and from hunters’ rifles. Meanwhile, in addition to running patrols in Gardiner and West Yellowstone, we are gearing up for our Week of Action which begins on Monday. We are really excited about the week’s events, and hope that you will be able to join us for some or all of them. If you are not able to attend in person, you will still be able to participate: on Tuesday we will have a National Call-In Day targeting decision-makers who can make a positive difference for wild buffalo. We don’t want them to prepare for our calls, so these targets will be announced via a special alert on Tuesday morning. You can also make a difference for wild buffalo by taking action on our Endangered Species Act alert urging Congress to fully fund and strengthen the ESA and also by contacting Montana legislators and Montana Governor Steve Bullock to encourage them to repeal a state law - MCA 81-2-120 - that gives the Montana Department of Livestock authority over wild buffalo when the migrate into Montana, and to support a plan that respects wild buffalo like wild elk in Montana. 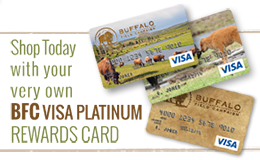 MCA 81-2-120 is the catalyst for many other nefarious management schemes — including the Interagency Bison Management Plan -- that negatively impact our National Mammal, the sacred buffalo. Thank you for everything you continue to do for the country’s last wild, migratory buffalo!